Hello, my name is Mark and I am the Branch Manager at Easirent Belfast International Airport. My team and I welcome you to Northern Ireland where we have a super range of affordable hire cars ready for collection. Arriving at Belfast International Airport by air, Please make your way to the pick-up point outside arrivals where you should then call the branch to arrange your shuttle transfer. Arriving at Belfast International Airport by train the nearest rail station to the airport is Kent Railway Station in Cork City, which is under five miles from the terminal. Connections to all major rail-linked towns and cities in Ireland can be made from Kent Railway Station. Arriving at Belfast International Airport by bus, the Airport Express 300 operates a regular service on weekdays and weekends from Belfast city centre to the bus stop located opposite the terminal exit. Dropping off your car at Belfast International Airport, Belfast Airport is situated just 18 miles north-west of Belfast and is easily accessed via the major road and motorway network. Our branch, which is located in Karl Business park nearby can be found signposted off the A57. The passenger terminal at Belfast Airport is located on two floors – the upper floor for departing passengers and the lower floor for arriving passengers. Facilities for departing passengers include cash machines, currency exchange, airport information, Business Lounge, baby change facilities and an excellent range of shops and restaurants for all your holiday extras. A visitor information desk is located in the arrivals hall for all domestic and international arriving passengers, providing information on visitor attractions, onward travel and accommodation. Currency exchange for international arriving passengers can be found in the international baggage reclaim area and car hire desks can also be found in the domestic arrivals area. Free WIFI is available for all passengers at Belfast Airport in the main departure lounges. To enjoy your free WIFI, simply log onto safe and secure WIFI for up to two hours, making it possible for you to post and Tweet before you board your flight. Check the weather in your destination right before you take off on our secure, free WIFI network! The third phase of a major toilet refurbishment programme has been completed at the airport. The new toilets and baby changing facilities, which are located airside convenient to retail and food outlets, cost close to half a million Pounds. The complete make-over lasted ten weeks. There are six cubicles and six sinks installed in the female facility with four cubicles, six urinals and four sinks in the male toilets. Also included is a WC and baby changing area. The work included replacing the entire ventilation system. If you are looking to hire a rental vehicle for the duration of your stay in Northern Ireland then check our prices first. 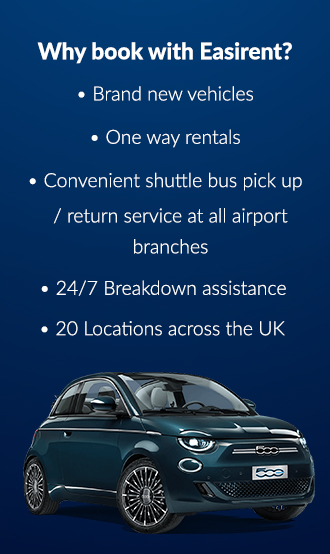 The team at Easirent Car Hire Belfast International Airport branch are waiting to serve you with the best service and with a large range of car’s suitable for all purposes including short weekend breaks to long term business hire you can rely on Easirent for all your car hire requirements.